Summary: A respectable but not a spectacular set of figures, with underlying revenue and profit both advancing by 5%. Although progress at the group’s main Thorlux division looks to have stagnated, last year’s Dutch acquisition appears to be performing very well. A special 2p per share dividend was a welcome move, but a cash pile of 30p per share suggests much more could be distributed. I continue to hold. Click here for my earlier TFW posts. I was quite satisfied with these results. Excluding the contribution from an acquisition made last year (see below), revenue and operating profit both advanced around 5% to £34.3m and £5.8m respectively. The improvement was below the double-digit pace seen during the preceding full-year results, and the moderated rate of expansion was not a great surprise. TFW had already flagged at its November AGM that it had experienced a “mild softening” in some of its markets. For what it is worth, TFW described the first-half performance as “solid”. I was a bit disappointed that TFW’s main Thorlux division reported revenue and profit up only 1% on the first half of last year. Indeed, since TFW began disclosing Thorlux’s half-yearly revenue in 2008, the division had always reported higher revenue during H1 than the preceding H2. All told, I do get the impression progress at Thorlux has now stalled. As this division contributes 80% to TFW’s profit, a prompt return to double-digit earnings growth for the wider group could be somewhat difficult. 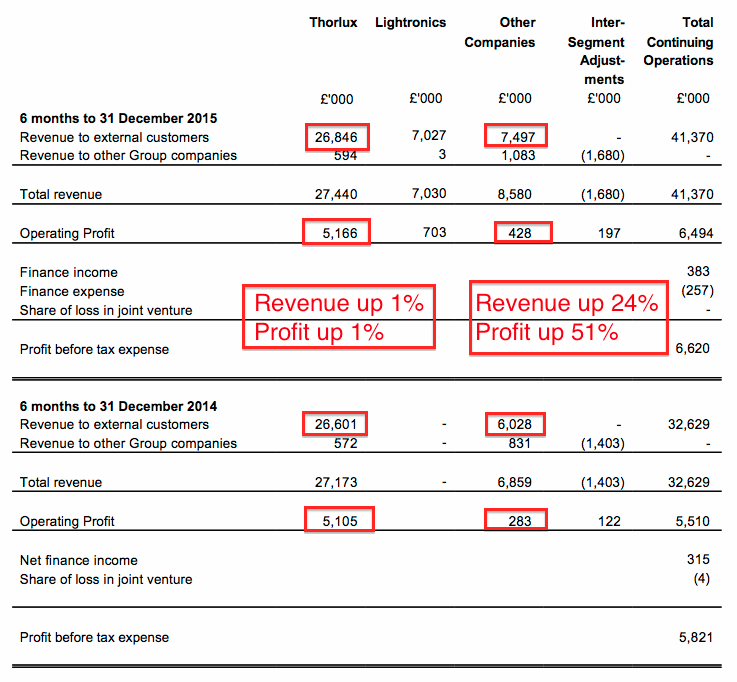 At least Thorlux remains very profitable with a 19% operating margin. TFW purchased a Dutch lighting firm called Lightronics for approximately £9m back in April 2015, and I am pleased this acquisition has continued to trade “ahead of expectations”. The previous annual results claimed the Dutch subsidiary produced revenue of £10.9m and an operating profit of £1.2m for the year to June 2015. However, following today’s figures, we can see Lightronics has generated revenue of £10.3m and a near-£1.2m operating profit during its first nine months of TFW ownership. True, TFW has cited “one-off projects” as helping the acquisition’s performance. But all the same, the early progress at this new division does appear encouraging. I note the associated earn-out relating to this acquisition has been increased by £200k to £4m, presumably to reflect the subsidiary’s higher earnings. It was nice to see TFW declare a 2p per share special dividend alongside lifting the interim payout by 9% to 1.2p per share. And while the upcoming special dividend will be the fourth TFW has declared since 2006, I do wonder if the group’s shrewd family managers could distribute even more one-off payouts. I mean, these results showcased cash of £34m, or about 30p per share — more than enough to fund a few larger payouts. Indeed, if you add in various other surplus investments and assets, and then subtract the Lightronics earn-out, the overall net cash and investment position comes to £41m (35p per share). Don’t get me wrong — I am all for companies operating with net cash. But holding the equivalent of three times annual earnings looks a tad excessive to me. One theory I have heard is that TFW may be hoarding cash so one day it can buy out the shareholdings owned by members of the Thorpe family. * Guessing at a £1.4m full-year contribution from the Dutch subsidiary, trailing operating profit now stands at £15.9m. 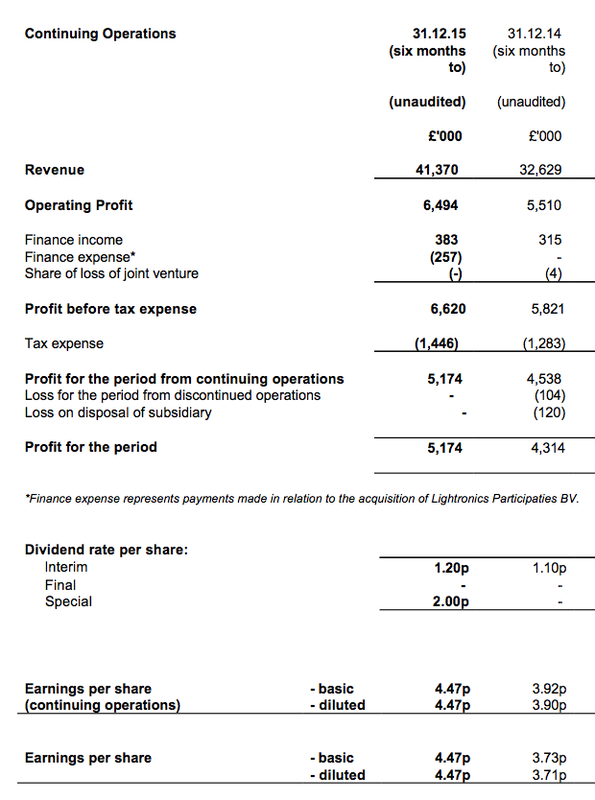 * Applying tax at the 22% seen in these results, earnings come to £11.7m or 10.1p per share. * Adjusting for the group’s net cash, investments and that acquisition earn-out, I calculate an enterprise value (EV) of £214m or 185p per share. * Then dividing that 185p EV figure by my 10.1p earnings guess, I arrive at a P/E of 18. * That multiple does not look an obvious bargain to me given the group’s underlying growth rate has slowed to about 5%. * Meanwhile, the trailing 3.75p per share dividend pays a meagre 1.9% income. When you proposed this business on TMF back in late 2007 / early 2008 you received some criticism because of the volatility and general upward price movement at the time of the buy call. (Not from me I hasten to add!) I guess it was a smaller cap back then. A little patience meant a better buying opportunity. Now with a few years of hindsight your call has been shown to be an excellent one. I’d say that this was the finest investment tip I received; 300% return on capital plus lots of big dividends on the way. Thanks for this one. Maybe it will still be in pension until I retire too! Thanks for the comment — it is good to hear from you. I recommended TFW twice for TMF, once back in 2004 for the Value Investor tipsheet, and once in 2009 for Champion Shares PRO. Now that I think was the finest investment tip I ever produced! The latter rec I recall was at about 60p, but the immediate price-spike meant the PRO portfolio ended up buying at around 70p I think. It has not gone unnoticed that, after six years, TFW shares are now among the better performers on the PRO portfolio. 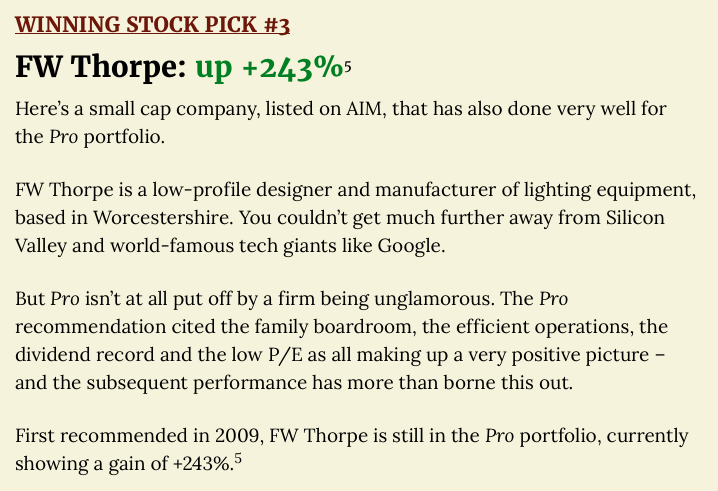 Mountview Estates, Paypoint, Google and Daejan were other decent picks in hindsight. Not all my selections were winners, but I am sure those five have more than offset my losers (I am still holding onto Record, for better or worse!). Thankfully, these days I get to write about and invest in TFW-type shares, but not have the aggro of 000s of paid-for subscribers and those darn prices spikes! I trust TFW will serve us both well in the future! In fact, that TFW purchase in PRO was so good, it is still being highlighted today for the service’s marketing. I am pleased about that. Google is still being used, too. The mention of that 2009 tip seems to have invoked another mention today, this time in Pro advice to part sell. 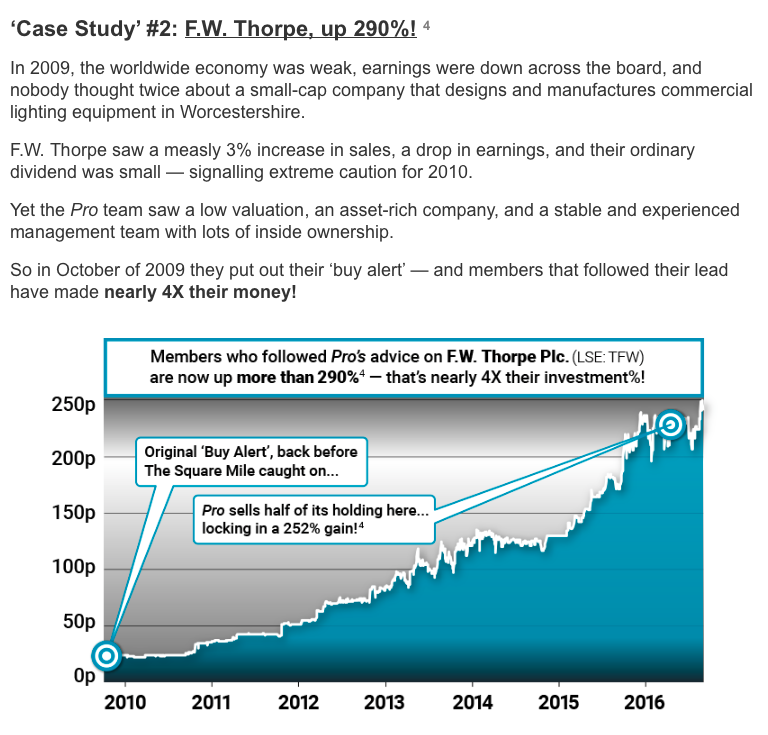 I remember the TFW tip well Mayn on CS PRO and as I was new I lost out buying on the initial share spike price. Anyway I held on and made a good return but sold a few years back sadly! And of course my favourite that you indirectly recommended, TAST! Now that is a winner. I’m holding my breath for the end of year announcement due any day. I think TAST was a recommendation in the forerunner to PRO. Anyway, it is either my 1st or 2nd largest holding now, so yes I too am looking forward to the results.